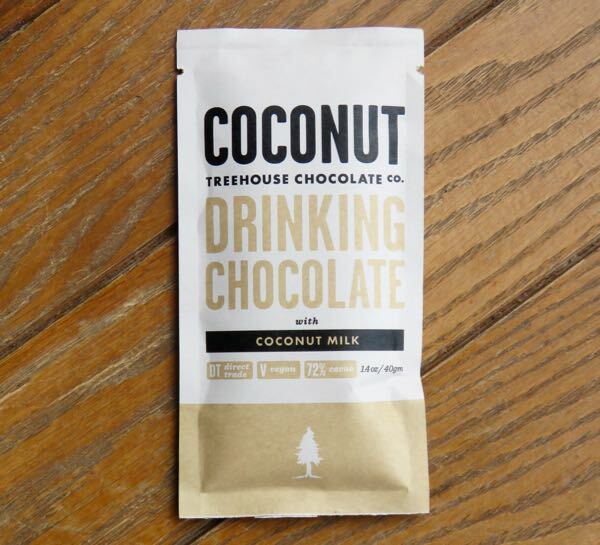 Coconut and coconut oil consumption have risen in the U.S. in the past several years; and there are more chocolate offerings that include coconut in some form. 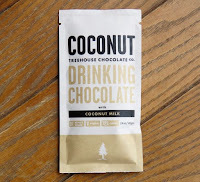 Today's Coconut Drinking Chocolate from Treehouse Chocolate Co. (Portland, OR) was made with 72% cacao sourced from the Oro Verde Cooperative in Peru. And the packet of dry mix contained coconut nectar and coconut milk. 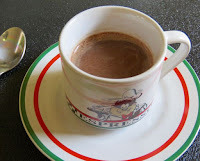 This vegan drinking chocolate was not too sweet, allowing one to enjoy the cacao and coconut flavors. It could be blended with hot water, a coconut beverage/milk, or used to make a vegan confection (add some nut butter, coconut oil, honey or maple syrup, etc. ).